Tacoma, Wash. - Tommy Milone delivered the first Tacoma Rainiers quality start of the season Monday, going seven scoreless innings in a 10-0 rout against the Albuquerque Isotopes in the final game of Cheney Stadium's first homestand of 2019. Milone (1-0) allowed just three hits and a walk in the victory, striking out a trio of Isotopes (7-5) across his seven innings, lowering his ERA to 3.94. After Milone's impressive outing, 18-year-old right-hander Deivy Florido became the first Tacoma Rainiers player born in the 21st century in franchise history. Florido, born September 17, 2000, pitched a pair of scoreless frames with three hits, a walk and a punch-out in his Triple-A debut. 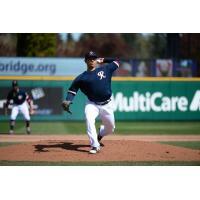 The teenager was added to the Rainiers roster before Sunday's game three. Offensively, the Rainiers were quiet until the fifth but exploded for all 10 runs over the course of three innings. Tacoma scored four in the fifth, starting with a run-scoring groundout from third baseman Shed Long that pushed across center fielder Tito Polo. Later in the inning, Joey Curletta belted his second home run of the season, a rocket to left field that scored three and extended Tacoma's lead, 4-0. In the sixth, right fielder Ian Miller drove a two-run triple in to the gap, his first of the campaign. He would then score on Long's infield single to the right side. An inning later, it was Miller again who came up big with his first round-tripper of 2019, a three-run homer to right-center. Altogether, Miller collected five RBI, a new season-high for a Rainiers hitter. All nine Rainiers batters notched at least one hit in the victory, with Polo, Miller and designated hitter Eric Young, Jr. all recording two hits. Shortstop J.P. Crawford's first inning single extended his hitting streak to a Rainiers-best 10 games as the former Philadelphia Phillies top prospect increased his average to .318 during the seven-game stay at Cheney. The 10-run victory was the largest of the season and Monday also marked the first shutout of the year for Rainiers pitching. Tacoma hits the road Tuesday for the start of a three-game series in El Paso against the Chihuahuas. Right-hander Tyler Danish (0-2, 18.41) will seek his first win of the season as he faces off with El Paso righty Cal Quantrill (1-1, 8.31). First pitch from Southwest University Park is scheduled for 6:05 p.m. PDT. Mike Curto will have the call on South Sound Talk 850 with audio streaming available on the Rainiers TuneIn Radio Network.